Five to 7% of all pregnancies are complicated by preeclampsia. Proteinuria and hypertension dominate the clinical picture, because the chief target organ is the kidney (glomerular endotheliosis). The pathogenesis of preeclampsia is complex; numerous genetic, immunologic, and environmental factors interact. It has been suggested that preeclampsia is a two-stage disease (1). The first stage is asymptomatic, characterized by abnormal placental development during the first trimester resulting in placental insufficiency and the release of excessive amounts of placental materials into the maternal circulation. This in turn leads to the second, symptomatic stage, wherein the pregnant woman develops characteristic hypertension, renal impairment, and proteinuria and is at risk for the HELLP syndrome (hemolysis, elevated liver function enzymes and low platelets), eclampsia, and other end-organ damage. This review focuses on the pathophysiology of stages 1 and 2 and then considers the potential that changes in soluble angiogenic factors may underlie much of the disease process. On the basis of the observation that the only definitive cure for preeclampsia is delivery of the placenta and that women who experience a molar pregnancy, in which a placenta develops without a fetus, frequently develop severe preeclampsia, it is reasonable to assume that the placenta plays a central role in the pathogenesis of the disease. Pathologic examination of placentas from preeclamptic pregnancies generally reveals placental infarcts and sclerotic narrowing of arteries and arterioles, with characteristic diminished endovascular invasion by cytotrophoblasts and inadequate remodeling of the uterine spiral arterioles (2). Although gross pathologic changes are not always seen in the placentas of women with preeclampsia, placental profiles including abnormal uterine artery Doppler and placental morphology have been used to identify a subset from a cohort of high-risk women who go on to develop the syndrome (3). Uterine artery Doppler studies that assess the pulsatility index (PI) reveal increased uterine vascular resistance well before the clinical signs and symptoms arise (4,5). Moreover, mechanical constriction of the uterine arteries produces hypertension, proteinuria, and, in some species, glomerular endotheliosis, supporting an causative role for placental ischemia in the pathogenesis of preeclampsia (6). Mammalian placentation requires extensive angiogenesis to establish a suitable network for the supply of oxygen and nutrients in the fetus. A variety of pro- and antiangiogenic factors are elaborated by developing placentas. It is believed that placental angiogenesis is defective in preeclampsia, as evidenced by failure of the cytotrophoblasts to convert from a more epithelial to endothelial phenotype, based on cell surface marker studies (6,7). Normally, invasive cytotrophoblasts downregulate the expression of adhesion molecules that are characteristic of their epithelial cell origin and adopt a cell-surface adhesion phenotype that is typical of endothelial cells, a process that is referred to as pseudovasculogenesis (7,8). In preeclampsia, cytotrophoblast cells fail to undergo this switching of cell-surface integrins and adhesion molecules (5). This abnormal cytotrophoblast differentiation is an early defect that may eventually lead to placental ischemia. Others have demonstrated that hypoxia-inducible factor-1 is upregulated in preeclampsia and suggest that it and its target genes may play a central role in the abnormal differentiation phenotype of preeclampsia (9,10). Whether this lack of conversion of cytotrophoblasts to an endothelial phenotype in women with preeclampsia is a primary or secondary event remains uncertain (11). The abnormal placentation that results from failure of trophoblast remodeling of uterine spiral arterioles is thought to lead to the release of secreted factors that enter the mother's circulation, culminating in the clinical signs and symptoms of preeclampsia. All of the clinical manifestations of preeclampsia can be attributed to glomerular endotheliosis, increased vascular permeability, and a systemic inflammatory response that results in end-organ damage and/or hypoperfusion. These clinical manifestations typically occur after the 20th week of pregnancy. Accommodation to normal pregnancy includes a decrease in both systolic and diastolic BP as a result of a decrease in systemic vascular resistance primarily secondary to vasodilation. Relaxin, which is released from the ovaries under the influence of human chorionic gonadotrophin, upregulates nitric oxide synthase (NOS) (12), the enzyme that generates NO from arginine, via the endothelial endothelin B receptor (13). In preeclampsia, derangement of endothelial-derived vasoactive factors is thought to result in the predominance of substances that are vasoconstrictors (endothelin, thromboxane A2) over vasodilators (NO, prostacyclin). Hypertension, defined as repeat BP measurements ≥140/90 mmHg, results from abnormal vasoconstriction. Normal pregnancy in the rat is accompanied by increased production of NO and its second messenger, cyclic guanosine 3′5′ monophosphate (14) with a parallel increase in renal expression of constitutive NOS (12,15). In the pregnant rat, an infusion of NG-nitro-l-arginine methyl ester (L-NAME), an exogenous inhibitor of NOS, has been shown to replicate some of the hemodynamic features of preeclampsia (16). l-Arginine supplementation reversed these adverse effects of L-NAME on pregnancy, attenuating hypertension, significantly decreasing proteinuria, and reducing the proportion of injured glomeruli (17). However, in humans, evidence to support a role of NO deficiency in the pathogenesis of the hypertension in preeclampsia has been conflicting. Although elevated circulating levels of asymmetric dimethyl arginine, an endogenous inhibitor of NOS, has been a consistent finding in pregnancies that are complicated by preeclampsia, plasma concentrations are typically very low with a narrow distribution among healthy adults, making quantification extremely challenging and the clinical significance of the finding uncertain (18–20). Furthermore, l-arginine supplementation has not conferred significant benefit in women with pregnancies that are complicated by preeclampsia (21,22). Another hypothesis considered the possibility that an early gestational exaggeration of the normal accommodation to pregnancy can be used to identify and may be pathogenic in preeclampsia (23). A longitudinal study that used Doppler echocardiography in 400 primigravidas throughout pregnancy noted a significantly increased cardiac output without any difference in peripheral vascular resistance in the 24 women who eventually developed preeclampsia compared with healthy control subjects (24). This increased cardiac output was followed by a marked reduction in the cardiac output and increased peripheral vascular resistance with the onset of the clinical syndrome. This notion of a crossover in the hemodynamic profile in women who develop preeclampsia resulted in a handful of studies that used β blockers in a preventive manner (25–27). These studies were typically small and/or uncontrolled. Furthermore, reduced fetal growth was noted in the women who received the β blockers, possibly because of an overaggressive decrease in the cardiac output (26,27). More recently, attention has again turned to the renin-angiotensin system (RAS) to provide a pathophysiologic understanding for the hypertension of preeclampsia. In normal pregnancy, all components of the RAS are upregulated, but resistance to the pressor effects of angiotensin II (AngII) allows for normal to low BP (18,19). Similarly, reduced sensitivity of the renal circulation has been demonstrated in pregnant rats as AngII infusion failed to decrease GFR, renal plasma flow (RPF), and urine flow (28). One explanation may be increased plasma levels and urinary excretion rates of Ang(1-7), a potent counterregulator of AngII, documented in human pregnancy (29,30). Ang(1-7) was demonstrated to be significantly decreased in women with preeclampsia compared with normal pregnant control subjects (29). It is interesting that evidence supports decreased levels of renin, AngI, and AngII in women with preeclampsia compared with normal pregnancy (31). Despite this, enhanced vascular sensitivity to components of the RAS is seen in women with preeclampsia. Enhanced vascular sensitivity to an angiotensin infusion can identify women who are at increased risk for the development of preeclampsia (32,33). Recent studies have identified an autoantibody of the IgG subclass in the plasma of women with preeclampsia that is capable of stimulating the AT1 receptor (34). When serum from preeclamptic women was added to cultured neonatal rat cardiac myocytes, the chronotropic effect could be blocked by losartan, confirming the effect was mediated via the AT1 receptor (35). Furthermore, the autoantibody might stimulate heterodimerization between the AT1 receptor and the B2 receptor for bradykinin (36). This may play an important role in the enhanced vascular sensitivity to angiotensin. It might also induce the production of reactive oxygen species, which block cytotrophoblast invasion in vitro and may relate to shallow trophoblastic implantation, thus accounting for several of the clinical features of preeclampsia (37). This autoimmune activity wanes after delivery (34). More recently, these antibodies also were found in patients with acute vascular rejection (38), suggesting that they may play a role in other forms of endothelial injury as well. Precise physiologic measurements in conjunction with immediate postpartum biopsies were used to examine the determinants of the GFR in women with preeclampsia as compared with healthy gravid control subjects (41). The GFR was significantly depressed to 91 ml/min per 1.73 m2 in women with preeclampsia compared with a value of 149 ml/min per 1.73 m2 in the control subjects. Of interest, no significant differences were found in either RPF or πGC. The morphometric analysis revealed significant ultrastructural differences, including swelling of the endothelial cells, subendothelial fibrinoid deposition, and mesangial cell interposition (Figure 1). 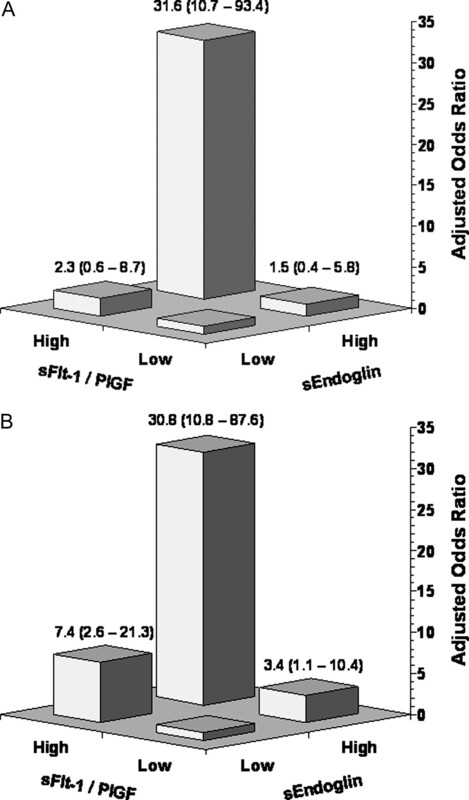 Scanning electron microscopy was used to characterize the endothelial fenestral dimensions, allowing the authors to conclude that a reduction in the density and the size of the endothelial fenestrae and subendothelial accumulation of fibrinoid deposits severely lowered glomerular hydraulic permeability in patients with preeclampsia. Mesangial cell interposition also decreased available surface area for filtration, thereby resulting in a cumulative depression of Kf that was exactly proportional to the GFR. A more controversial conclusion was that the hypofiltration in preeclampsia does not have a hemodynamic basis. 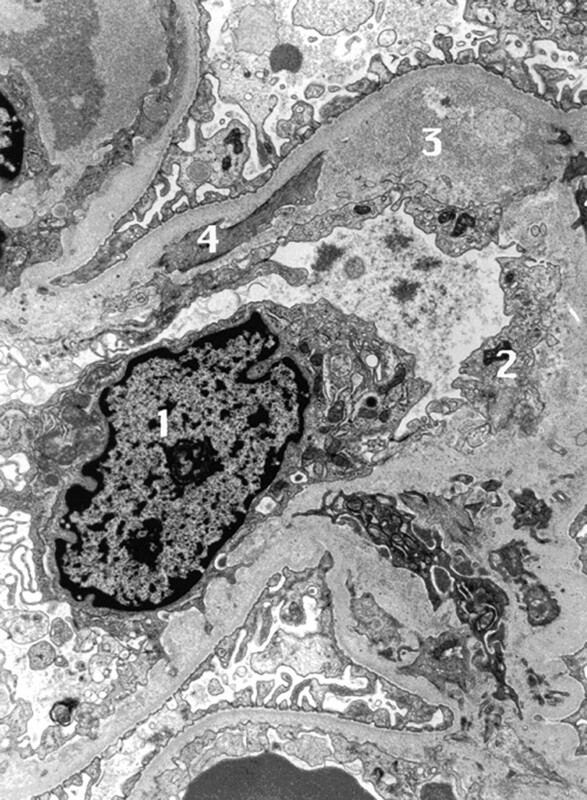 Transmission electron microscopy of a representative glomerular capillary enumerating pathologic changes associated with preeclampsia: 1, endothelial cell body; 2, swollen, nonfenestrated endothelium; 3, subendothelial fibrinoid deposition; 4, mesangial cell interposition. A recent study used a semiquantitative scale to grade the endotheliosis that was present on biopsy specimens that were taken from women with preeclampsia approximately 1 wk before delivery (42,43). They noted moderate to severe endotheliosis in all women with significant hypertension and proteinuria before delivery. Of interest, women with nonproteinuric gestational hypertension and normal pregnant women also exhibited endotheliosis but to lesser degrees, suggesting that pregnancy-induced hypertension may in some cases reflect an earlier or milder form of the same pathology (44). Subendothelial fibrinoid deposits and mesangial cell interposition were found only in women with preeclampsia. Unfortunately, the authors never published any images or acquired confirmation from a second blinded pathologist to ensure interobserver reliability. In a second article that examined the same patient population, the authors found a linear trend between glomerular volume reflecting the degree of endotheliosis and cystatin C (42), suggesting that the basis for the hypofiltration in preeclampsia is largely secondary to structural changes in the glomerulus as opposed to renal vasoconstriction and a depression in RPF. However, the utility of cystatin C as a marker of GFR is unclear in this patient population. A recent study found that cystatin C correlated poorly with third-trimester creatinine clearance (r = 0.27) (45), and another study that used inulin clearances for comparison found that the measurement is not independent of body composition as previously assumed (46). To date, cystatin C has not been validated as a marker of GFR in pregnancy, with several studies suggesting that it may be imprecise. In 1843, John Lever of Guy's Hospital in London discovered the presence of albumin by boiling the urine from pregnant women with puerperal convulsions. Preeclampsia is differentiated from gestational hypertension by the presence of proteinuria and is the most common cause of nephrotic syndrome in pregnancy. The quantity of protein that is excreted in the urine varies widely. Significant protein excretion is defined as ≥300 mg in a 24-h urine collection or 1+ or greater on urine dipstick testing of two random urine samples that are collected at least 4 h apart (47). Numerous studies have used a variety of methods to examine the biochemical constitution of preeclamptic urine, including protein selectivity indices, with variable results. Generally, urine from preeclampsia has demonstrated poor selectivity and has not differed significantly from other forms of primary renal disease (48). Glomerular proteins of intermediate size, such as albumin, have been identified alone or in combination with varying degrees of tubular proteins, such as B2-microglobulin, reflecting the tubular damage that can occur in severe preeclampsia (49,50). Unfortunately, the exact role of the endothelial cell layer in the regulation of glomerular permselectivity remains the least well defined. Endothelial cells are difficult to acquire for in vitro studies, and, unlike the podocyte, there are no specific markers for this cell line. Perforated by large fenestrae, the endothelial cell layer does not contribute to size selectivity, allowing the passage of neutral molecules with a radius up to approximately 375 Å. Therefore, the mechanism for proteinuria in preeclampsia is not well understood. The glomerular basement membrane and podocytes typically appear normal (33,36). Few investigators have used dextran-sieving techniques to elucidate the properties of the glomerular filtration barrier in women with preeclampsia. In the 1970s, MacLean et al. (51) confirmed the glomerular origin of proteinuria in preeclampsia demonstrating dextran-sieving coefficients in the intermediate range. This finding was corroborated by a more recent study that demonstrated a loss of size selectivity significant for bands 31 to 39 Å (P < 0.0001) as well as 41 to 49 Å (P < 0.01) (52). Without more specific studies, the authors alluded to the fact that loss of charge selectivity was likely the primary defect in the glomerular filtration barrier in women with preeclampsia. New insights into the role of angiogenic factors in the maintenance of an intact glomerular filtration barrier may reconcile the presence of nephrotic-range proteinuria in an endothelial cell disease (see Circulating Angiogenic Factors in Preeclampsia). In preeclampsia, endothelial injury may also become manifest as a low-grade coagulopathy with increased fibronectin, increased platelet aggregation, shortened platelet survival, and depressed antithrombin III levels (53). The HELLP syndrome develops in up to 10% of pregnancies with severe preeclampsia, and evidence exists to suggest that it is not simply an epiphenomenon of extreme hypertension. Plasma concentrations of cellular fibronectin have been shown to be consistently higher throughout pregnancy in woman who develop preeclampsia compared with healthy control subjects. In addition, markers of platelet activation, including β-thromboglobulin, as well as assays of platelet aggregation have been demonstrated to precede the clinical manifestations of the disease (54,55). Seizures with other neurologic symptoms, including headache and visual disturbances, complicate approximately 5 of every 10,000 live births, with a declining incidence as a result of improved prenatal care with expedited delivery and, possibly, the widespread use of magnesium sulfate (56). The precise mechanism that is responsible for the development of seizures is not clear, but proposed theories include cerebral vasospasm, edema, and the possibility that severe hypertension might disturb cerebral autoregulation and disrupt the blood–brain barrier. The cerebral edema of eclampsia predominantly involves the posterior, parieto-occipital lobes and is similar to images described in reversible posterior leukoencephalopathy syndrome (57). This finding on magnetic resonance imaging has been noted to correlate better with markers of endothelial dysfunction, including lactate dehydrogenase, red blood cell morphology, and creatinine than the level of hypertension (58,59). Of interest, reversible posterior leukoencephalopathy syndrome in patients with thrombotic thrombocytopenic purpura has also been found to be independent of the level of hypertension in some cases (60). Recently, two endogenous antiangiogenic proteins of placental origin—circulating soluble fms-like tyrosine kinase 1 (sFlt1) and soluble endoglin (61)—have been suggested, on the basis of rodent models, to play a causal role in the pathogenesis of preeclampsia (62,63). sFlt1 is a secreted protein, a splice variant of the vascular endothelial growth factor (VEGF) receptor Flt1, which lacks the transmembrane and cytoplasmic domain of the membrane-bound receptor. Circulating in the blood, it acts as a potent antagonist to VEGF and placental growth factor (PlGF). Both VEGF and PlGF are made by the placenta and circulate in high concentration during pregnancy. Circulating sFlt1 levels are greatly increased in women with preeclampsia even before the onset of clinical symptoms (64). Consistent with the action of the circulating protein to bind PlGF, free PlGF levels are also decreased in preeclamptic women before the onset of clinical symptoms (64). When administered to pregnant and nonpregnant rats, sFlt1 produces a syndrome of hypertension, proteinuria, and glomerular endotheliosis that resembles preeclampsia (62). It has also been shown that VEGF induces endothelial fenestrae in vitro, and the loss of 50% of VEGF production in the mouse glomerulus leads not only to glomerular endotheliosis but also to loss of glomerular endothelial fenestrae similar to what is noted in human preeclampsia (65). Antagonists of VEGF, used in antiangiogenic oncology trials, sometimes produce hypertension and proteinuria in humans (66,67). Finally, higher circulating levels of the chromosome 13–encoded gene product sFlt1 in pregnancies with trisomy 13 may explain the increased risk for preeclampsia in women who carry fetuses with trisomy 13 (68). In addition to its role in the pathogenesis of preeclampsia, circulating concentration of sFlt1 and PlGF may have important predictive and diagnostic implications. The concentration of sFlt1 starts to rise near the end of the second trimester in women who are destined to have preeclampsia, a full 4 to 5 wk before clinical manifestations are first detected (64). By the time preeclamptic manifestations are pronounced, plasma concentrations of sFlt1 are greatly elevated, from two to four times the levels found in normal pregnancy, and are greatest in patients with severe preeclampsia. In women who develop preeclampsia, there is a modest but significant decrease in PlGF levels beginning as early as the first trimester. From midpregnancy onward, the concentration of unbound PlGF in plasma falls significantly lower at the time when sFlt1 levels are rising. Unbound PlGF is also freely filtered into the urine and thus may also serve to predict the subsequent development of preeclampsia (69). Endoglin (Eng) is an angiogenic receptor that is expressed on the surface of endothelial cells and placental syncytiotrophoblasts. Eng acts as a co-receptor for TGF-β, a potent proangiogenic molecule. Eng mRNA is upregulated in the preeclamptic placenta (63). Moreover, the extracellular region of Eng is proteolytically cleaved, and soluble Eng (sEng) is released in excess quantities into the circulation of preeclamptic patients. In pregnant rats, sEng exacerbates the vascular damage that is mediated by sFlt1, resulting in severe preeclampsia-like illness, including the development of a HELLP-like syndrome and fetal growth restriction (63). In explant cultures of trophoblasts from 5 to 8 wk of gestation, mAb to Eng and antisense Eng oligonucleotides stimulated trophoblast outgrowth and migration (70). TGFβ1 and/or TGF-β3 inhibits trophoblast migration and invasion, and it seems that Eng mediates this effect. Therefore, it has been speculated that production of sEng by the placenta may be a compensatory mechanism to limit the effects of surface Eng. In recent clinical studies, sEng was elevated not only during the disease but also before onset of symptoms (71). Elevations in sEng were particularly pronounced—and, therefore, potentially most useful for prediction—in women who developed preterm preeclampsia or preeclampsia with an infant who was small for gestational age. Although the gestational pattern of sEng concentration tended to parallel the trajectory of the sFlt1/PlGF ratio, multivariate analysis indicated that each was significantly associated with preeclampsia. Indeed, a composite measure that incorporated all three angiogenic molecules (sFlt1, sEng, and PlGF) was more strongly predictive of preeclampsia than the individual biomarkers (71) (Figure 2). Adjusted odds ratios for preterm (A) or term (B) preeclampsia according to soluble fms-like tyrosine kinase 1:placental growth factor (sFlt1:PlGF) ratios and soluble endoglin levels. Preeclampsia remains a common complication of pregnancy that leads to unacceptable increases in fetal and maternal morbidity and mortality, particularly in less developed nations. Efforts continue to understand better the pathophysiology of the clinical manifestations of the disease. Recent findings on the role of circulating antiangiogenic factors have generated great optimism for being able to predict better the disease and develop therapeutic advances. If subsequent trials validate these theories, then future work should lead to renewed efforts finally to explain and treat this complex disease. Dr. Karumanchi is listed as co-inventor on a patent filed by the Beth Israel Deaconess Medical Center for the use of angiogenic proteins for the diagnosis and treatment of preeclampsia. Dr. Karumanchi is a consultant for Johnson & Johnson, Abbott, and Beckman-Coulter.